How often do you take the time to appreciate what you have? We forget to be grateful for the simplest blessings3 in our life: each breath, clean water, food, a roof over our head4, good health, friends, family, the sun, nature, and being able to wake up to a new day. We allow “internal dragons” disguised5 as thoughts of fear, anxiety, and worry to take us away from the abundance6 that is here in the present moment, and we miss out7 on the opportunity to live a fulfilling8 life with the people that we love. This same principle applies to your English learning journey. There will be times along the journey where you feel discouraged. You will feel like you’ve hit a plateau9 and your English skills aren’t improving. You will feel frustrated with yourself because you think that you aren’t doing enough. In these low moments, it’s important to remember why you started on this journey in the first place, to appreciate where you are at (the progress that you’ve made), and the challenges that are to come. 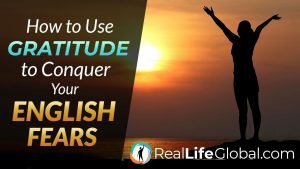 When you are feeling down or off track, you can use gratitude to get back on track10 and overcome the self-limiting beliefs11 that are keeping you from living your English and practicing daily. A daily gratitude practice is an essential habit that will give you the confidence to face your English fears. Gratitude is the “sword” that you will take along with you on your journey. You will use it to battle against the resistance of self-limiting beliefs, excuses, and procrastination12 and to slay internal dragons13 of fear. With this weapon you will be able to level up14 to your highest potential as an English learner. If you want to take your English abilities to the next level and start cutting through your dragons with ease, it is absolutely essential to “sharpen your sword15” with daily habits of gratitude. If you are on the journey to RealLife English fluency, then you want to strive18 gratitude everyday is through mindfulness. The practice is a type of meditation that makes you feel completely aware of your current environment and senses. It is proven to boost19 your brain power, enhance focus, relieve stress, and cure depression. It brings you back to the present moment. Instead of thinking about the past or worrying about the future, you focus on the here and now. You appreciate the most subtle20 details of life, from the taste of fresh fruit to the sound of birds chirping21. You can practice mindfulness while doing just about any activity. You can go for a walk and pay attention to all the nature around you. If you love to eat, grab a fresh fruit such as an orange, and notice the smell of it as you peel22 it or the sweet, citrus flavor as you bite into it. Whether you are going for a walk or eating an orange, focusing on appreciating the small details that you sometimes forget about. Savor23 the moment. The traditional way to practice mindfulness is by finding a calm, peaceful place to sit, close your eyes, and breathe. One way to start your practice is by taking one deep breath, and counting up to five. Hold it for four seconds at the top of your breath, release the breath, and repeat this process for about 10 – 15 minutes. Here’s a 5-minute guided meditation for gratitude to get you started. During the process, observe your thoughts and senses. Reflect on the things you are grateful for today in English. Additionally, take the moment to congratulate yourself on the progress you’ve made living your English and appreciate the challenges that you’ve already overcome throughout the journey. The process of cultivating mindfulness will help you become more patient with both yourself and with others along the journey to RealLife English fluency. It will help you develop a greater appreciation of the present moment. Along with these benefits, you will receive the power of self-awareness24 as you speak and listen closely to others as they speak in English, which will allow you to communicate better. If you are interested in developing your mindfulness and meditation practice, Insight Timer, is a good app to get started. It has thousands of guided meditations in English, as well as other languages. Make sure to join the “RealLife English Meditators” group when you download the app so you can meditate with us! Practicing gratitude is a scientifically supported way to increase your long-term fulfillment25 and overall well-being. Reflecting on what you are grateful for each day changes the way you think and feel. When you do this in English, you open your mind to a new perspective of the language. You start to associate English with optimism and positive thoughts. You break down the barrier of fear that once stood between you and the language. A simple way to start this practice is by keeping a gratitude journal in English. Every day schedule time to sit down and list at least three things you are grateful for and why you are grateful for them. Take this time to express gratitude for moments from last weekend, for the people in your life, the present moment, opportunities to learn, nature, places that you love, a new job, or a new experience. The list could go on forever. There are so many things in life to be thankful for. Here’s a template you can start with. When you take the time to pause and appreciate what you have, you end up attracting more positivity into your life because you learn to see the positive aspects of every situation. It is an essential part of the journey. The gratitude that you cultivate each day will give you the confidence and self-awareness to face any challenge or fear. 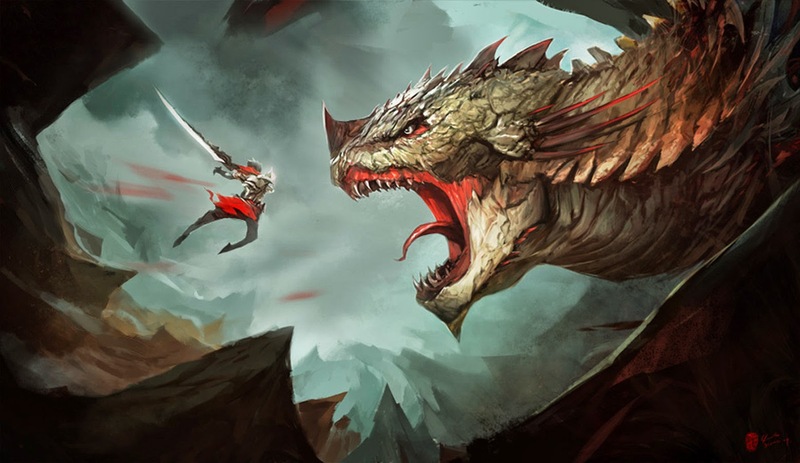 As you battle the dragons along your journey, you will carry a lethal26 weapon, the “sharp sword” of confidence and self-awareness, that comes from making gratitude a part of your daily routine. We all have inner obstacles27 or personal dragons that keep us from achieving our dreams. We are afraid to face them. We avoid them at all costs, even though we know that the potential reward that will come from confronting them could be great. A common dragon that you might face is the fear of speaking English in public. You are afraid to make a big mistake, to look bad28, to be made fun of29, or to be left out30 of the conversation, so you end up feeling nervous and uncomfortable. Instead of taking advantage of the present moment and practicing your English, you don’t say anything and just decide to listen quietly to everything that’s happening. You allow your fear to win and you miss out on the perfect opportunity to improve your English. It is time to change the way we see these dragons. As you encounter them throughout our journey, let’s not see them as a bad thing, but as an opportunity to grow. When they show up, what are you going to do? Don’t forget that you carry a deadly weapon. Remember the confidence and self-awareness that you’ve developed by practicing gratitude daily. Instead of resisting the dragon, take a moment to stare it in the eyes, appreciate it for everything that it is about to teach you, and dive straight into the belly of the beast31! When you start feeling uncomfortable while meeting English natives, giving a presentation, writing in your journal, listening to a podcast, or reading a book, take a deep breath and appreciate the present moment. It is the perfect opportunity to improve your English. Be grateful for the new challenge. Be fully present while it happens. Listen to the subtle sounds of the person’s voice you are talking to. Appreciate unfamiliar words that you’ve never heard before. Ask questions, and listen actively. Pay attention to your own voice and body language. Observe your emotions. There’s a reason you feel worried or anxious. Don’t fight this feeling. Flow with it32 instead of resisting and avoiding it. Step outside of your comfort zone. Make mistakes and learn from them. The greatest reward comes from the lessons you learn as you face your fears. Gratitude is a major key to success no matter where you are at along the journey to RealLife English fluency. It doesn’t matter if you just started to learn or you have been learning for years. Every day arm yourself with gratitude as you attack your biggest English fears. Make it a habit to run toward it every time you feel the discomfort arising. Explore that uncomfortable feeling of fear and anxiety from up close. And remember that cultivating gratitude will help you slay your inner dragons. Today is the day to conquer your English fears and to start living your best life! I really appreciate what you wrote, is helpful. I really appreciate you for reading! I hope you feel inspired to face your English fears! Thank you so much Zach! That was a great article. In fact, in a month ahead I’ll be speaking in English in front of a public for the first time in my life as I’ll be defending my PhD thesis. I used to do that in French or Arabic and it was OK. But this time, just thinking that I’m going to speak the whole time and respond to the comity’s questions in English freaks me out even if I’ve been practising my English for seven years now! I’ll give gratitude a try and hope it works. I bet Ahlem!! Public speaking even freaks me out sometimes.. Just remember to take a moment to breathe and be grateful for the opportunity to speak and present what you are passionate about. Thank you for remembering us the importance of gratitude. I’ve never seen gratitude as you described it here. I’ll remember this the next time I feel stuck or frustrated. Thank you Cindy!! Yes! Gratitude is the key to overcome your difficulties. I really appreciate this article.Thank you very much.